I have been around horses for 30 years. 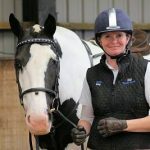 I’m an assistant coach at the Riding For The Disabled, I worked for a major and well known horse feed company for 2 years and I also hold the Monty Roberts Introductory certificate of horsemanship, so have a wide horsey knowledge (in specific areas….). The reason I am taking this course is because I have never owned my own horse, so there are some significant gaps in my knowledge and this course is definitely helping me fill in those gaps. I am learning lots (hence taking the time to really learn what’s missing) and am really enjoying it, so thank you.